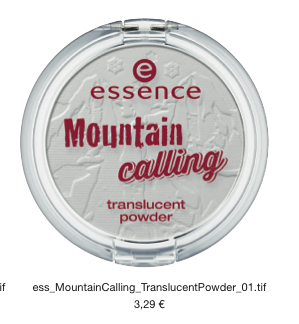 Sciencekoekje: Budget news: The essence translucent powder is back! Budget news: The essence translucent powder is back! I have been subscribed to the press mailing list at essence and catrice now for a while cause i believe that they from time to times bring out really beautiful makeup pieces at a budget. Not everything of them is great but if you know what to go for, you might be surprised at the quality you can get. I also love to buy this when i want to try out a really out there colour and do not feel like spending a lot of money on something which could potentially end up in the back of my makeup closet. Now Essence just send me a few days ago a mail about a new limited edition they are releasing in December called: Mountains calling. A collection oriented at ski season. I won't bore you with the whole release since you will find that over a lot of other blogs but i quickly wanted to show you the two items out of the collection which caught my eye. The first thing is the Mountain calling translucent setting powder. Essence had setting powders before and i heard that they are great value for money. So i think i will jump this time the train and give this a shot and at 3,29 it comes cheaper than a drink at Starbucks. The second thing i really like to try is the cream to powder blush. I really like the colour on the photo and could imagine that this could turn into a really nice hue on the cheeks for the cold winter month. This blush will cost only 2,79. So i guess i will let the Shopping Goblins have their way again beginning of December and give this a shot. You have any budget releases you are looking forward to buy? Let me know in the comments.